Master the art of sourdough, from creating a starter to baking and serving delicious loaves in this full-color, step-by-step, illustrated guide that demystifies this traditional bread that has been enjoyed around the world for generations. For a growing number of people, eating heathy is more important than ever. We’re rejecting processed, packaged foods filled with unpronounceable chemicals, and are embracing, organic whole foods, including whole grain and slow made breads like sourdough—the oldest method of bread baking. In this encompassing guide, a pair of bakers show you how to master this traditional style of bread which has never been more relevant or popular and is a favorite of artisan bakers. Sourdough features fifteen no-fail recipes with clear, step-by-step instructions and photographs to help you make your own artisanal loaves at home. The methods and recipes in Sourdough continue a tradition that is more than 5,000 years old: mix flour and water, then allow the dough to ferment and rise by itself. This extended fermentation process allows for maximum flavor—and easier digestion. 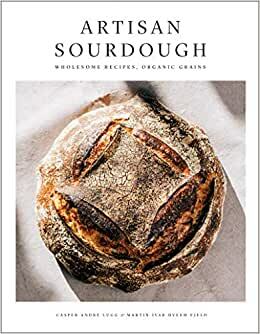 With an emphasis on local, heirloom, and ancient grains, Sourdough introduces the natural ingredients used in artisan baking, teaches how to make a stable starter, and explains how to “set the leaven” to create perfect baked loaves. The book comes complete with cook’s notes and a trouble-shooting section to help you to avoid soggy bottoms, over baking, and other common problems. Start reading Sourdough on your Kindle in under a minute. Good bread cookbook for the beginner as well as the experienced baker. The first pages give good advice on starters, shaping and problem solving. The recipes use a nice variety of flours and gives even the experienced baker new formulas/recipes to follow. After many books on high hydration doughs and organic ancient grains, this one is underwhelming to say the least. Only 13 recipes and no new knowledge would be gained if you are into this modern bread for a while. Very nice graphic design and photography. The photos in this book beautifully illustrate the process involved in producing exceptional sourdough bread. Follow their recipes and you will create perfect crumb and crust for which to die!!! I have tried countless sourdough recipes in search of the perfect artisan loaf using at least half whole grain flour. My search is over!!!!!!! I just sliced into a loaf of 50% Spelt bread. Best loaf I have ever made! This book is an essential addition to your sourdough library!!!!!!!!!! This book is beautiful and their method for baking sourdough is great. I wish there were more recipes, but it’s given me a great foundation to build off. Instructions are easy to follow, especially if you have a little experience with sourdough. Good step past flour water salt yeast. The step by step photos are good but it is all still a very complicated, time consuming process.